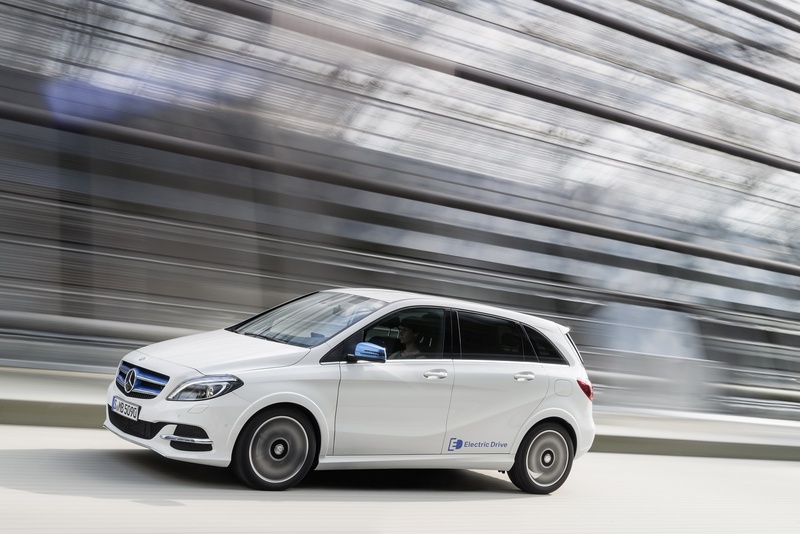 Η Mercedes-Benz ανακοίνωσε την ανανεωμένη B-Class η οποία θα κάνει ντεμπούτο στην έκθεση του Παρισιού. Το μοντέλο διαθέτει μικρές αλλαγές στο εξωτερικό, με νέο μπροστά προφυλακτήρα με μεγαλύτερες εισαγωγές αέρα, νέα γρίλια, νέα φωτιστικά σώματα μπροστά-πίσω, με τα μπροστά να διαθέτουν ενσωματωμένα τα LED φώτα ημέρας, νέο πίσω προφυλακτήρα και τραπεζοειδής απολήξεις εξατμίσεων. Στον επιπλέον εξοπλισμό υπάρχουν και LED μπροστά φωτιστικά σώματα. Το εσωτερικό έχει ανανεωθεί και αυτό, με την οθόνη 8″ να κλέβει τη παράσταση. Υπάρχουν έξι εκδόσεις εξοπλισμού (Style, Urban, AMG Line, Night, Exclusive και AMG Exclusive), με τον κρυφό φωτισμό να έχει 12 διαθέσιμα χρώματα. Συναντάμε επίσης νέο τιμόνι, ξύλινα διακοσμητικά, σύστημα Keyless-Go, σύστημα Collision prevention assist plus, με το σύστημα Αttention assist να αναβαθμίζεται και να λειτουργεί από ταχύτητες 60 έως 200 χλμ/ώρα, ενώ και το Traffic Sign Assist σύστημα έχει αναβαθμιστεί και μπορεί να διαβάζει πλέον περισσότερες πινακίδες κυκλοφορίας (και αυτές των ορίων ταχύτητας). Μηχανικά η μόνη αλλαγή είναι πως η B200 CDI είναι διαθέσιμη και σε 4MATIC τετρακίνητη έκδοση. Συγκεκριμένα υπάρχουν 5 κινητήρες πετρελαίου, 5 κινητήρες βενζίνης και ένας φυσικού αερίου, με την B-Class Electric Drive να αποδίδει 132 kW (180 άλογα) με 340 Nm ροπής. Περισσότερες λεπτομέρειες μπορείς να βρεις στο δελτίο τύπου που ακολουθεί. Stuttgart. 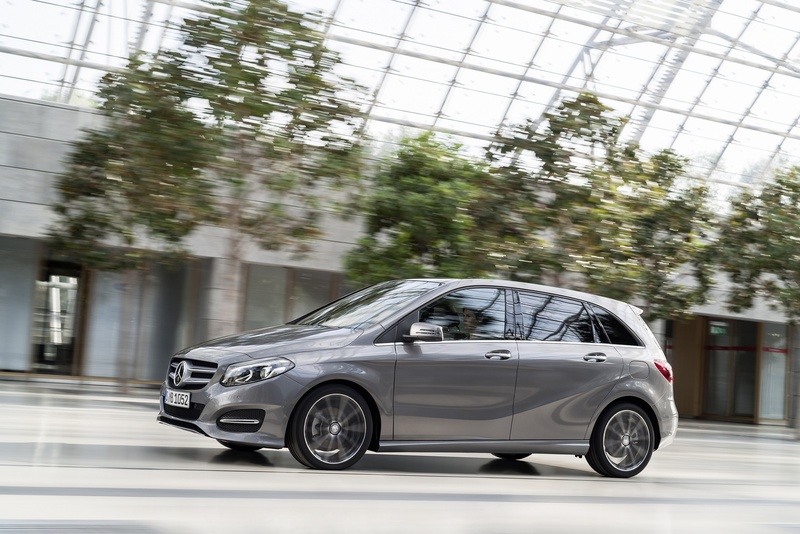 In terms of both design and technology, the second generation of the B-Class car has heralded a new compact class era at Mercedes-Benz. More than 350,000 of the sports tourer have been sold since the market launch in late 2011. 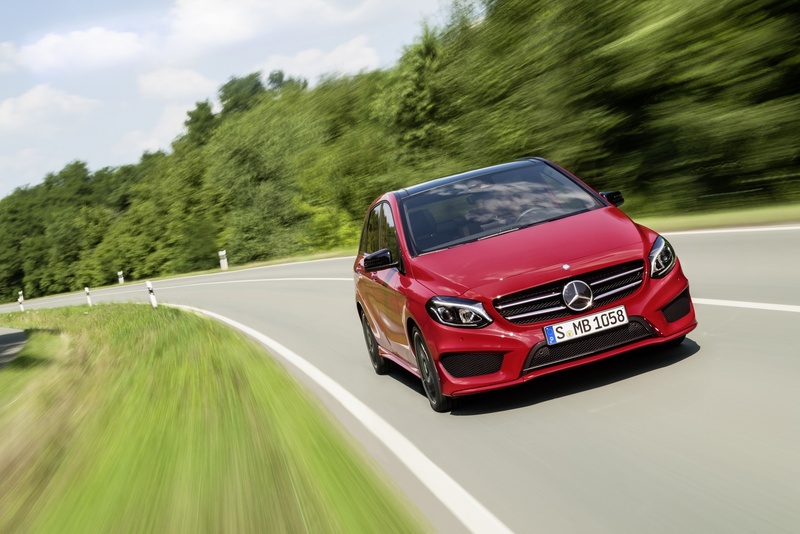 Now the best-seller from Mercedes-Benz has undergone a major facelift including exterior and interior enhancements along with attractive, redefined design and equipment lines. The breadth of choice is unique in this segment: five economical diesel models with consumption statistics ranging from 3.6 to 5.0 l/100 km, four efficient petrol engines at between 5.4 and 6.6 l/100 km, alternative drive systems (B 200 Natural Gas Drive and B-Class Electric Drive), as well as optional 4MATIC all-wheel drive. 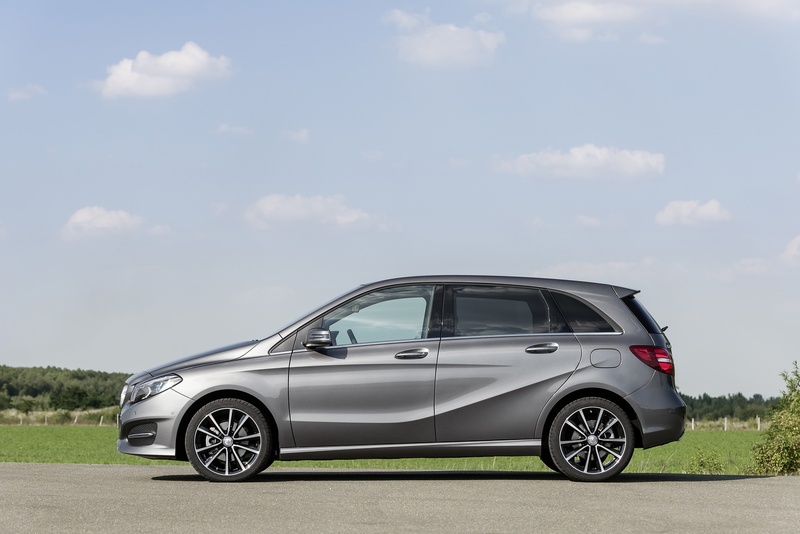 What is more, with a Cd value of less than 0.25 the sports tourer continues to be the role model for its class. 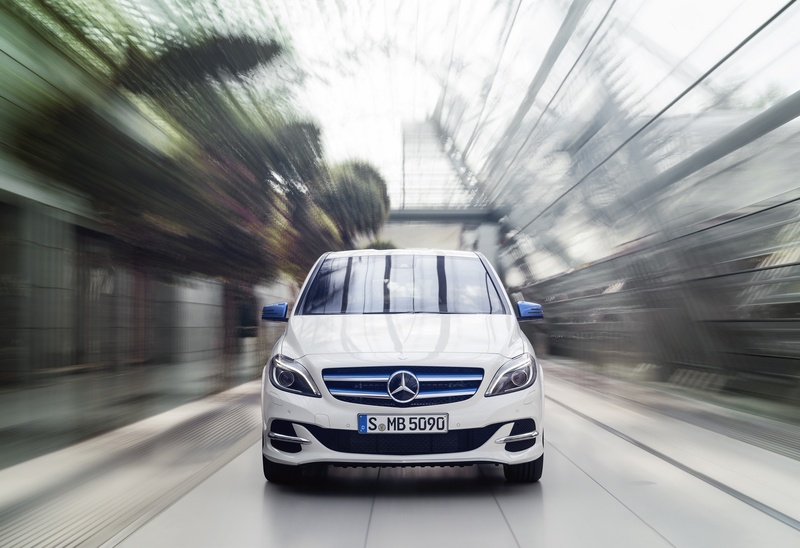 Sales of the new B-Class commence on 12 September, with the world première taking place during the Paris Motor Show (4 to 19 October). 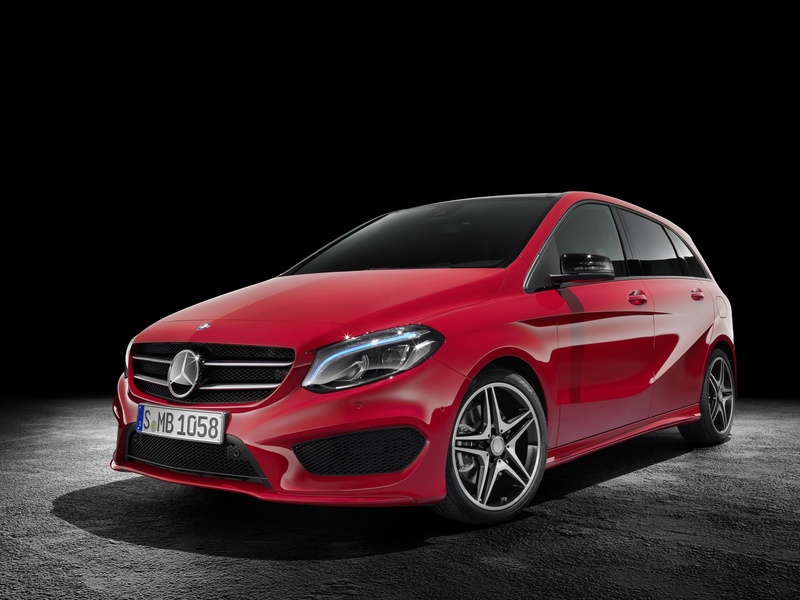 The revamped models will be making their way to dealerships from 29 November 2014. Prices start from 27,102.25 euros for the B 180. 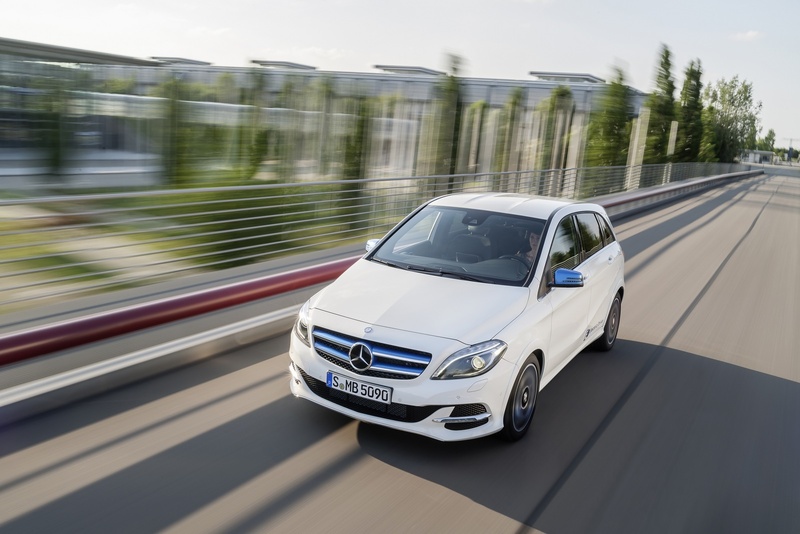 The easiest way to recognise a facelifted B-Class with a petrol or diesel engine is from the front: a new bumper, wide radiator trim with two louvres and now integral daytime running lamps in the headlamps give the vehicle a more organic and dynamic appearance. The rear bumper has also been modified and now features a contoured covering and an additional chrome trim strip. 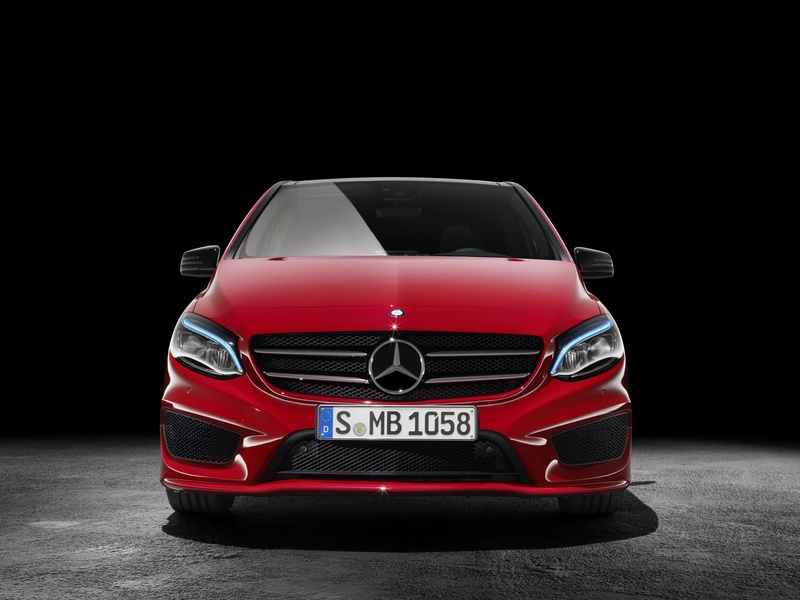 LED High Performance headlamps create a more striking look, both day and night (optional extra, not available for the B-Class Electric Drive or Natural Gas Drive). These increase safety at night due to their wide beam pattern and light of a colour similar to daylight. Bicolour tail lamps featuring LED technology provide emphasis and make the vehicle more visible. 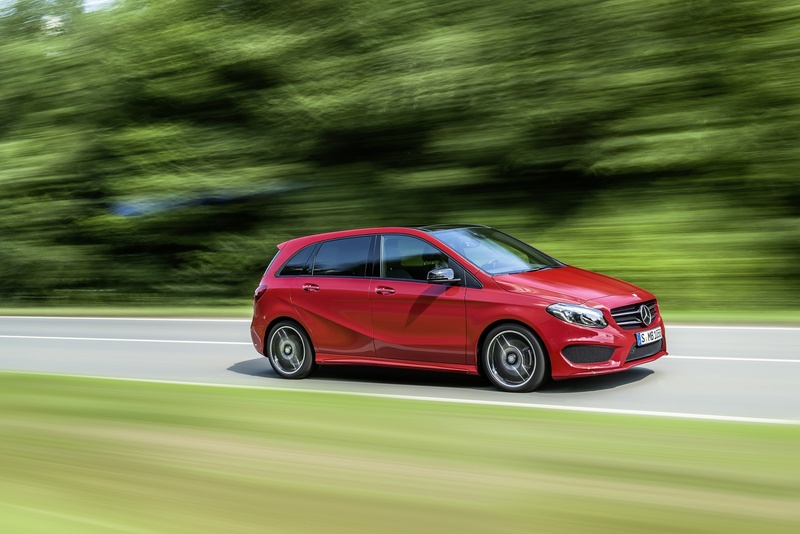 A high-grade, functional interior underscores the B-Class’s premium quality claim. 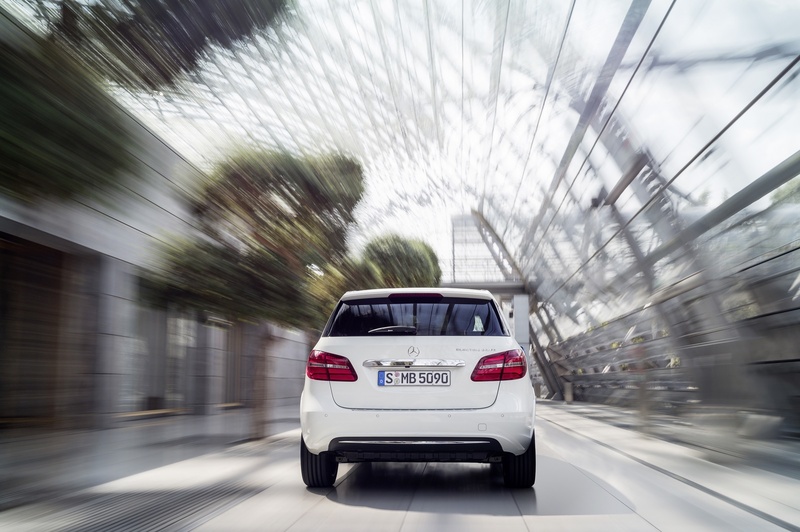 The facelift gives the vehicle a more exclusive, up-to-date feel and boosts the scope for individualisation. 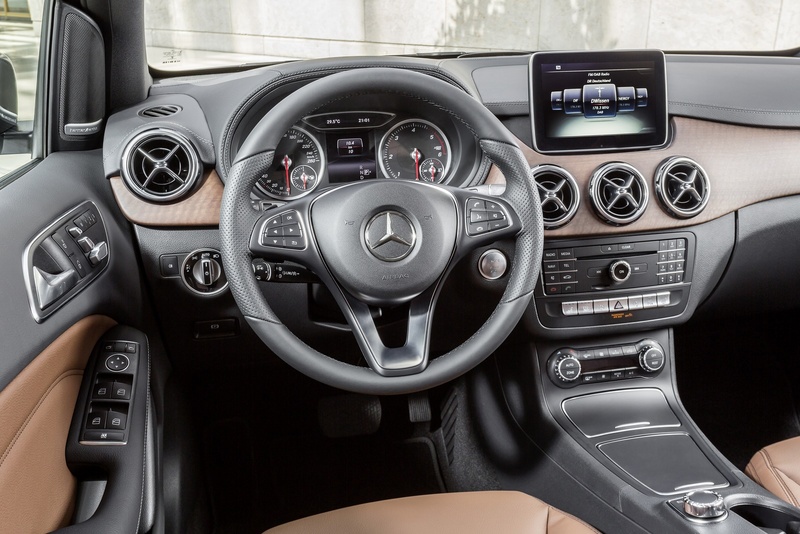 Mercedes-Benz has enhanced a number of high-quality details in the B-Class such as the large, free-standing head unit display, which is now larger, with a diagonal of up to 20.3 cm (8 inches), and the stylish dial layout for the instrument cluster. There is a choice of 12 colours for the ambient lighting, allowing different moods to be created. 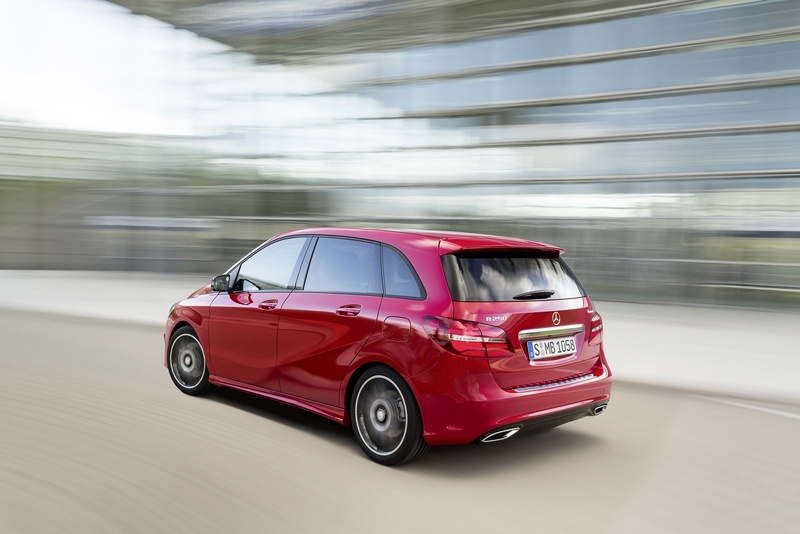 Mercedes-Benz has also revised the model range and aligned the logic to the other compact models. There are three new design and equipment lines: Style, Urban and AMG Line. Each features a number of distinctive exterior and interior details. 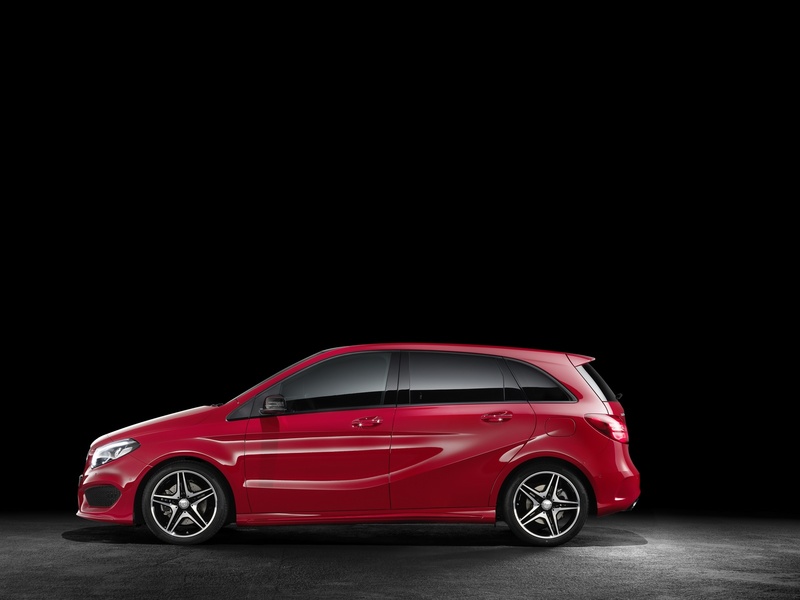 The Night, Exclusive and AMG Exclusive packages build on these and provide more options for individualisation. KEYLESS-GO is new as an optional extra. This access and drive authorisation system with KEYLESS-GO starting function allows the vehicle to be opened, started and locked simply by carrying the electronic key with you. 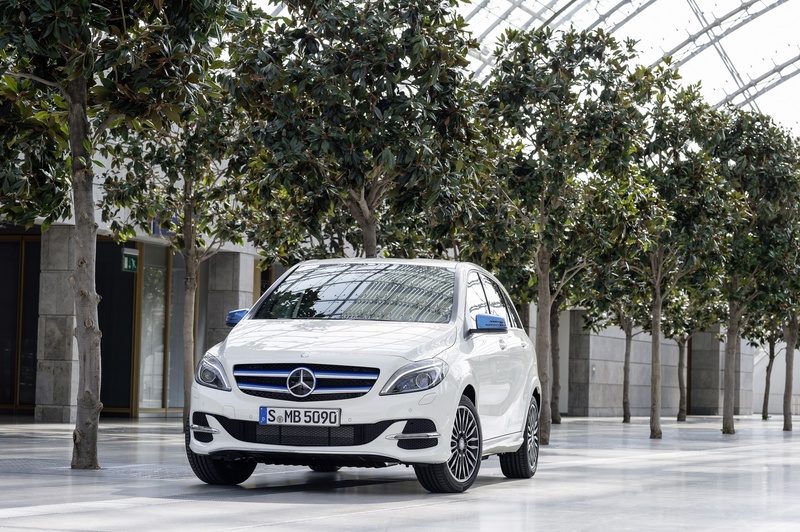 When it made its début, the B-Class redefined the standard of safety in the compact class with a variety of new driving assistance systems, some of them included as standard equipment. These functions have now been enhanced and new assistance systems added to give the driver more support. COLLISION PREVENTION ASSIST PLUS extends the functionality of COLLISION PREVENTION ASSIST with autonomous partial braking to reduce the risk of rear-end collisions. The standard ATTENTION ASSIST feature has also been upgraded: operating within an extended speed range (60 – 200 km/h), this now uses a five-stage bar display to visualise the driver’s current attention level. 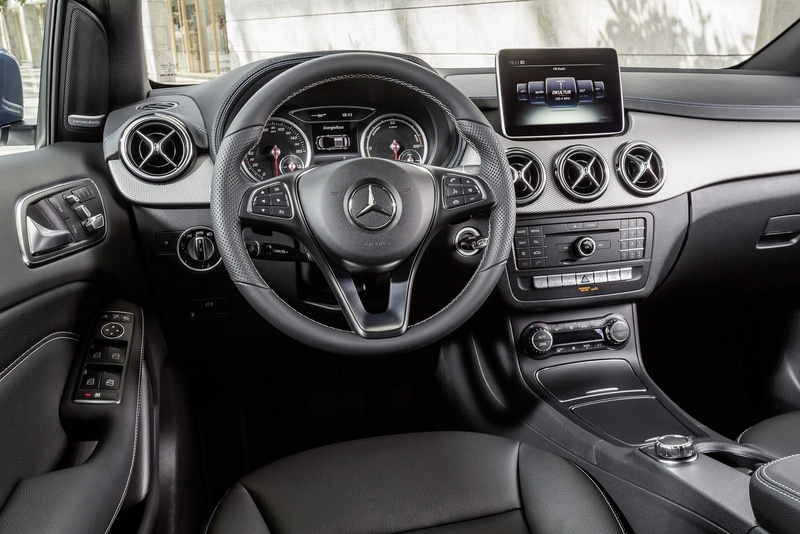 Next-generation telematics offer more intuitive operation; functions are more accessible due to animated menus and visual representations on a larger display in the head unit. 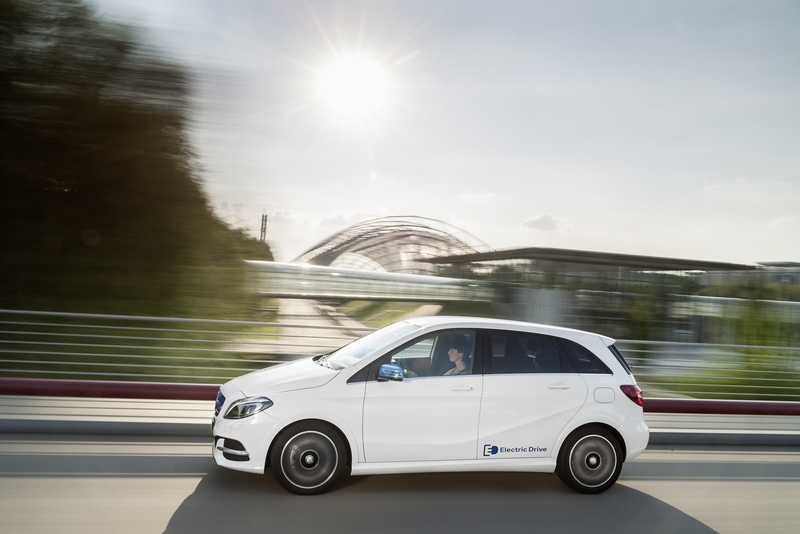 “Mercedes connect me” links the B-Class to its environment. 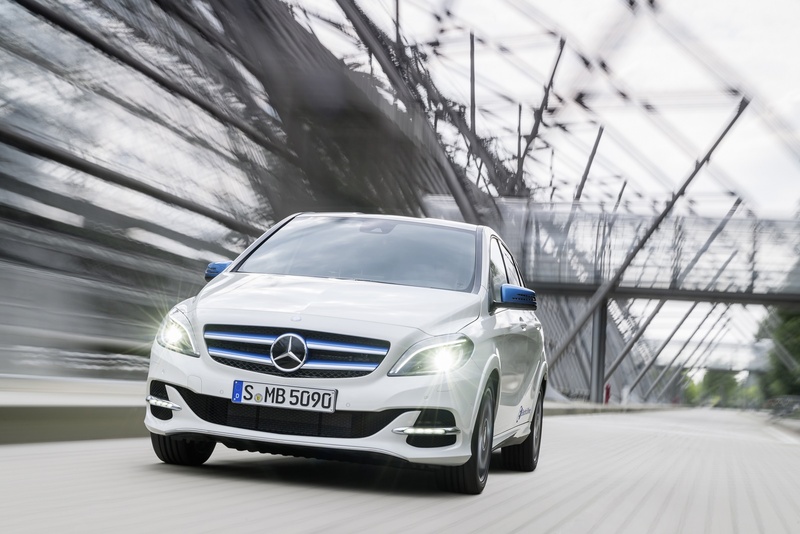 Basic Mercedes connect me services can be used with the standard communications module. The available services include, among others, accident recovery, as well as service maintenance and incident management. 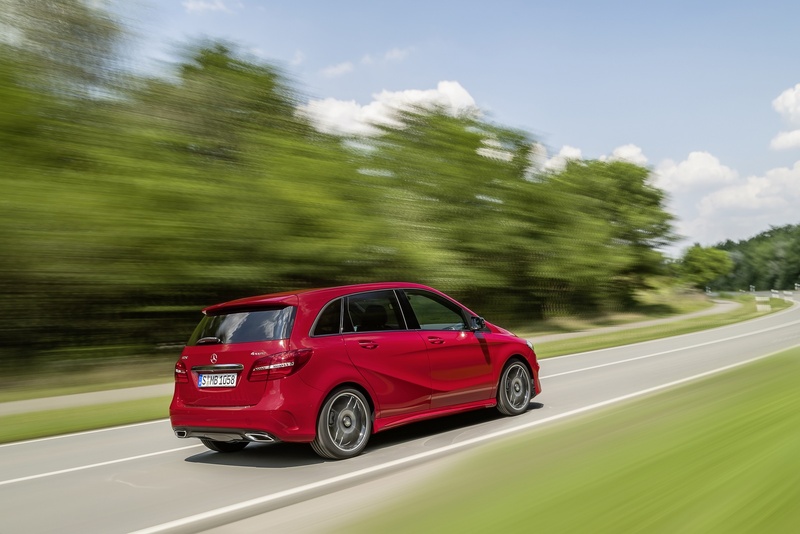 In an accident, the Mercedes-Benz emergency call system automatically connects the occupants with the Mercedes-Benz Emergency Call Centre and sends the position and condition of the vehicle to the rescue operations centre. A rescue vehicle can then be dispatched immediately. The system works automatically but can also be triggered manually. 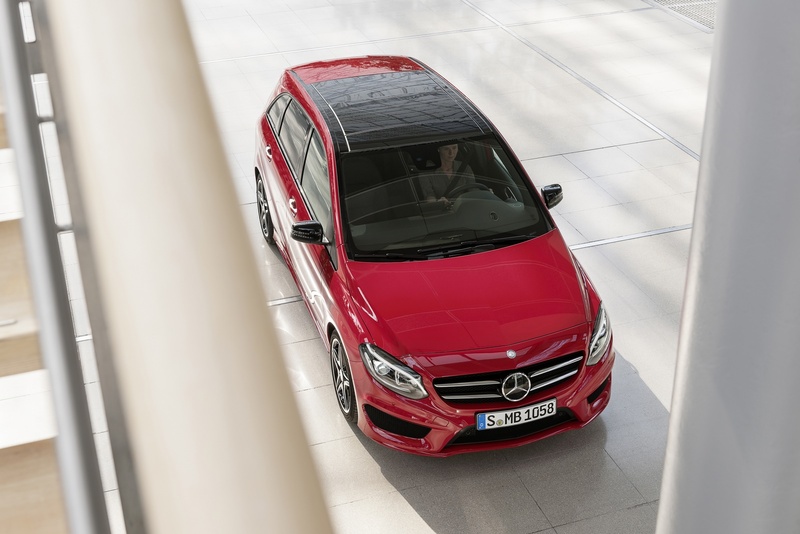 The special Remote Online equipment enables customers to connect with their vehicle anywhere and at any time via the URL “connect.mercedes.me” and to query by smartphone the fill level of their fuel tank, for example. 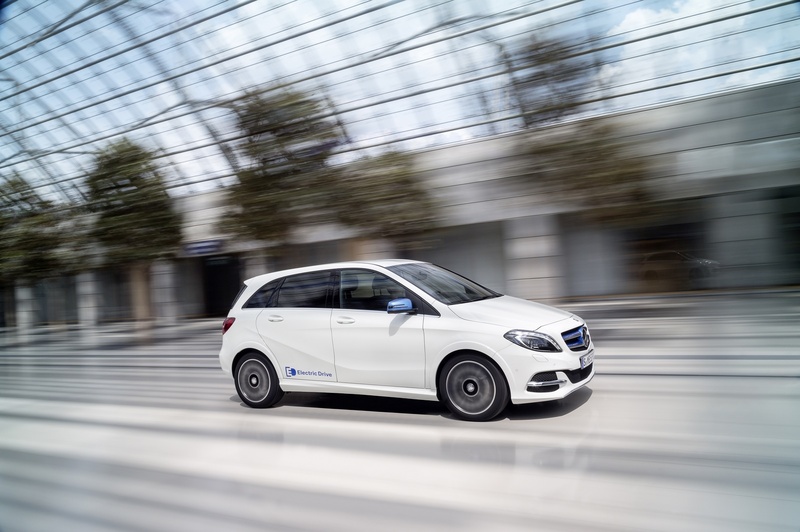 Mercedes connect me services are even more extensive for the B-Class Electric Drive: Via “connect.mercedes.me”. The current charging level of the lithium-ion battery and current vehicle range can be queried comfortably from a distance. 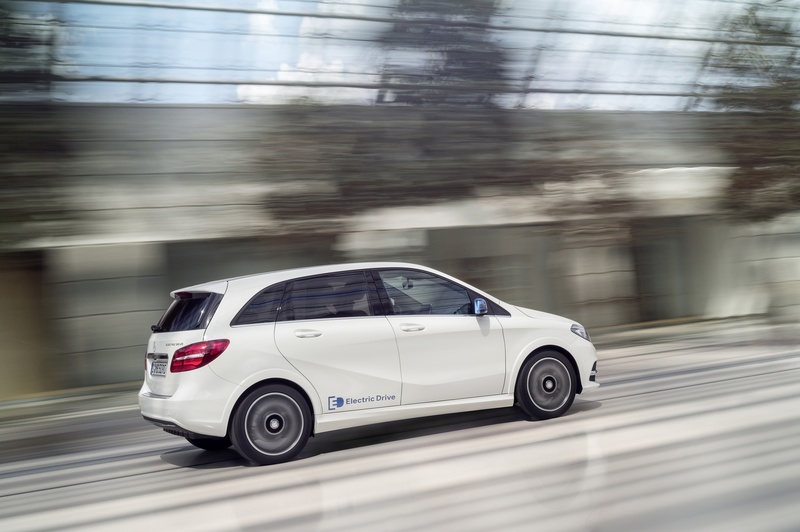 The range of Mercedes connect me services is rounded off by the ability (depending on the temperature) to preheat or precool the vehicle ready for a specified departure time. COMAND Online customers are also able to receive real-time traffic information courtesy of Live Traffic Information. 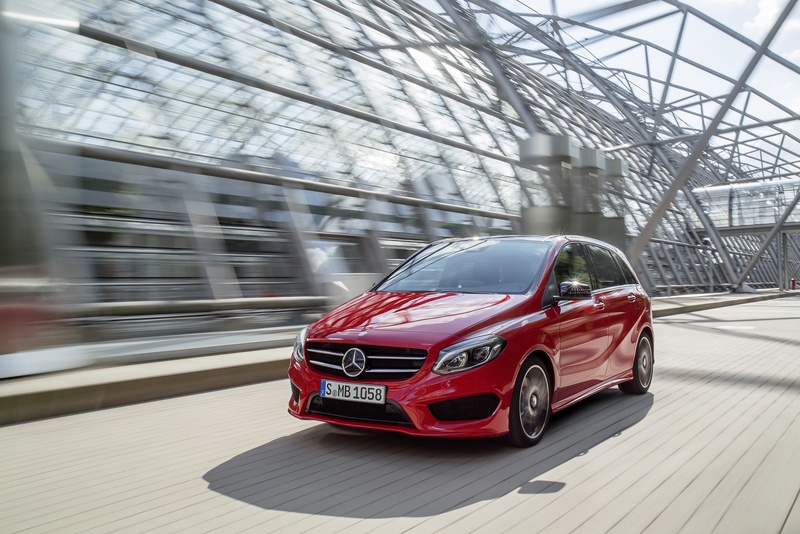 In terms of efficiency, the new B-Class continues to set benchmarks with the best Cd value in its segment. The choice of efficient engines is extensive – four diesel engines, four petrol engines and two models with alternative drive systems. 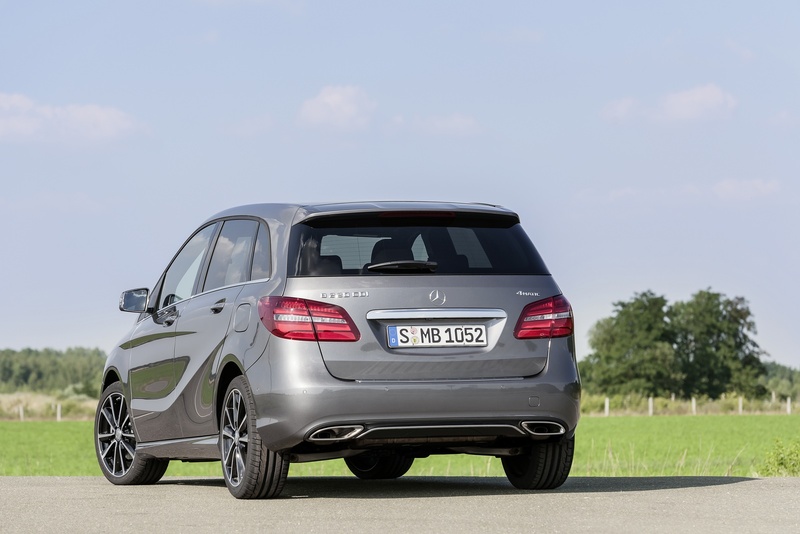 Also available are the B 180 and B 180 CDI BlueEFFICIENCY Editions. 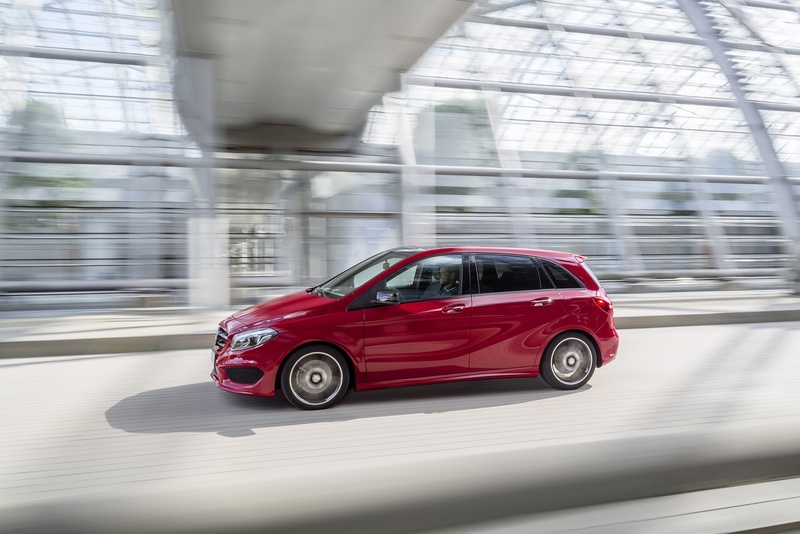 Thanks to the new B 200 CDI 4MATIC, the pleasure of all-wheel drive and safety now start at around 130 g CO2/km instead of over 150 g CO2/km (B 220 4MATIC) as previously. 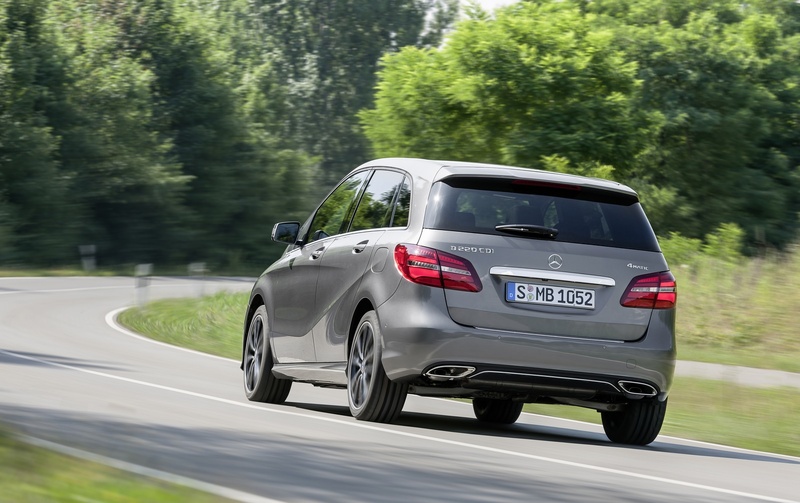 In total there are now four models with all-wheel drive for improved traction, high driving stability and safe handling. 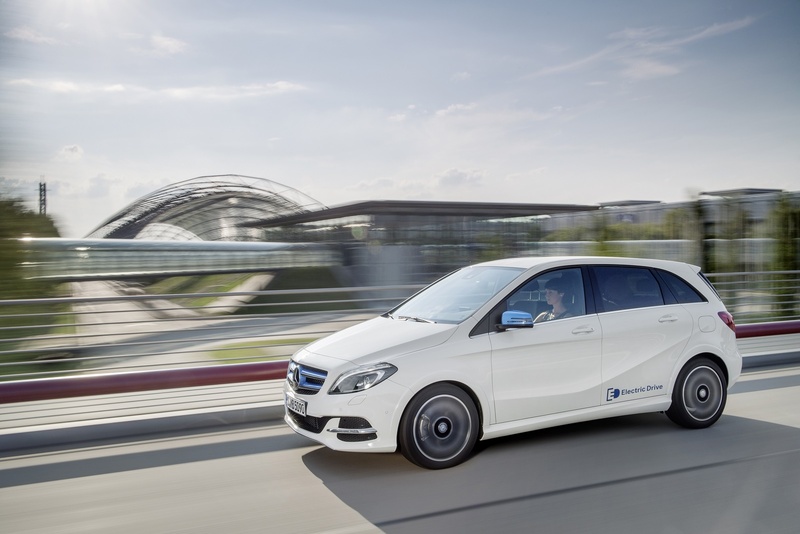 The B 200 Natural Gas Drive and the B-Class Electric Drive coming soon (sales release: 3 November) join the portfolio as two models with alternative drive systems. 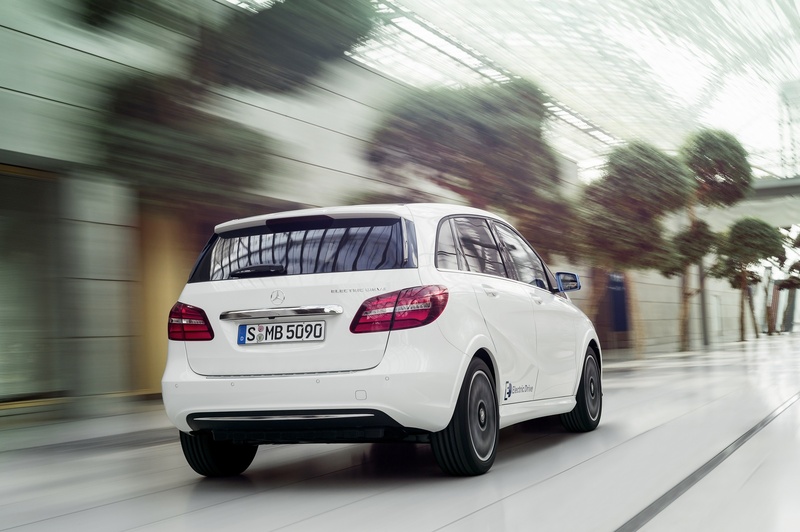 Both use the B-Class’s modular ENERGY SPACE body concept: The underbody houses one large and two smaller gas tanks and a 14-litre petrol tank (B 200 Natural Gas Drive) or the lithium-ion battery (B-Class Electric Drive). Due to this intelligent packaging method, the five-seater model has been able to retain the generously proportioned luggage compartment for which it is known. 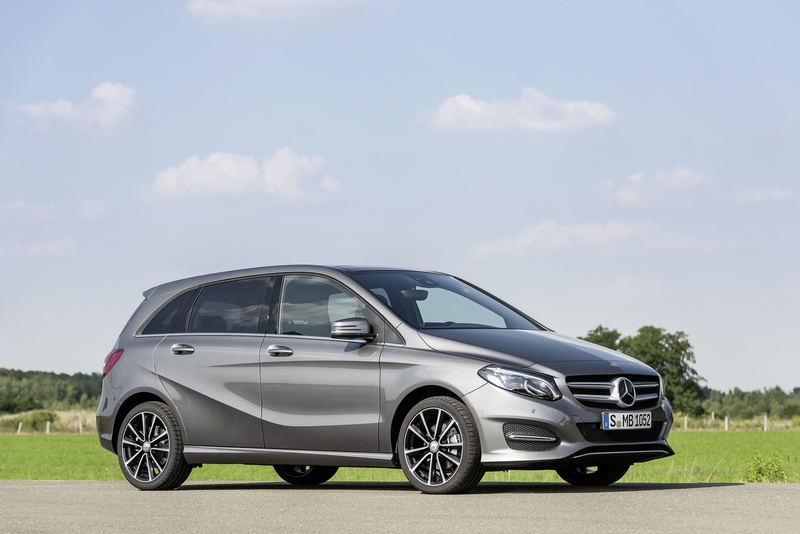 As part of the facelift, Mercedes-Benz has revised the B-Class’s model range and brought the model breakdown into line with the other compact models. There are three new design and equipment lines: Style, Urban and AMG Line. Each features plenty of distinctive exterior and interior details. 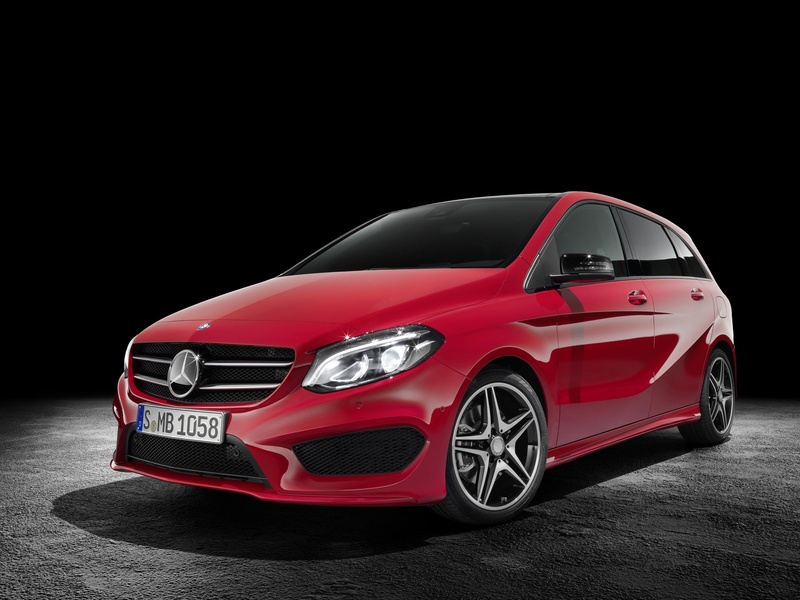 The Night, Exclusive and AMG Exclusive packages build on these and provide more options for individualisation. New KEYLESS-GO functions simplify operation. 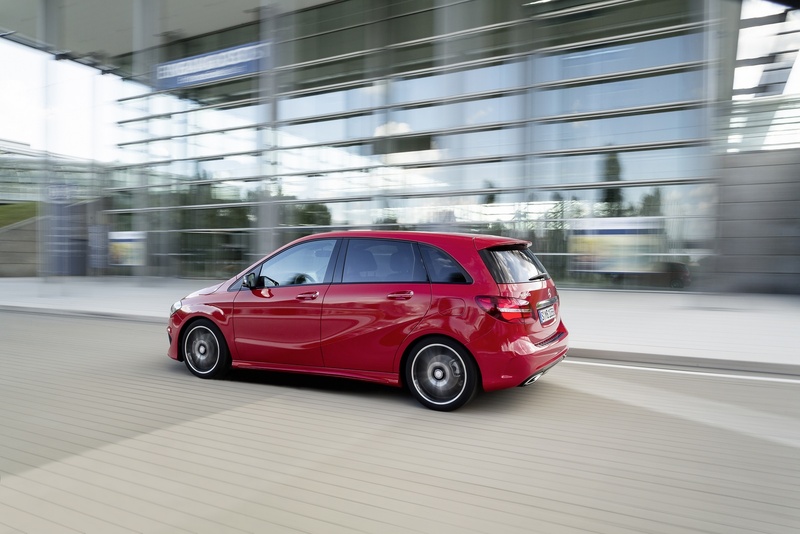 The Style equipment line underlines the B-Class’s stylish appearance. Exterior characteristics include light-alloy wheels in an expressive design, radiator trim with two louvres painted in iridium silver with chrome inserts, and shoulderline trim strips in chrome. For the stylish interior there are seats with Vianen upholstery fabric, trim with a line pattern, and selected elements in silver chrome such as the moulding on the multifunction steering wheel, highlights on the gear lever, and the switches on the top control panel. Useful details like a double cup holder on the centre console and a 12V socket in the rear round off the high-quality feel. 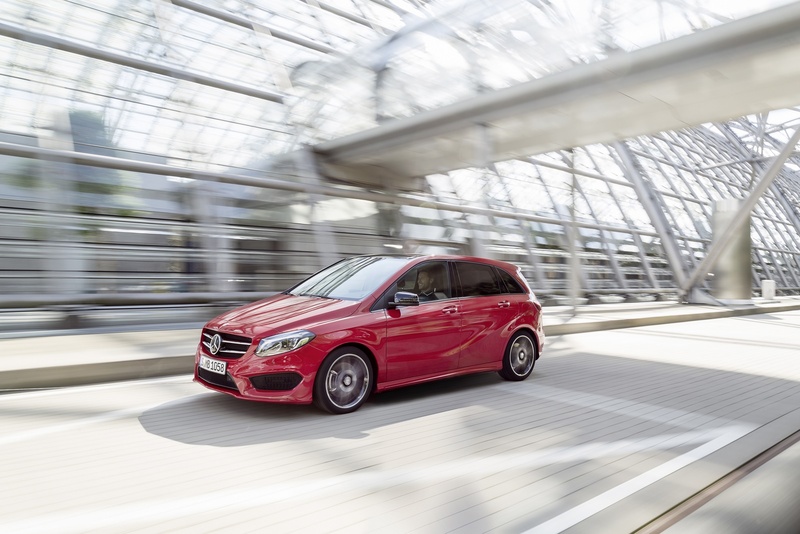 The Urban equipment line emphasises the vehicle’s sportiness both inside and out. The radiator trim with two louvres painted in iridium silver and chrome inserts, 43.2 cm (17-inch) 5-spoke light-alloy wheels, and a twin-pipe exhaust system integrated into the bumper with chrome-look tailpipe trim create a dynamic impression. In the interior the sporty character is on display with seats featuring upholstery in ARTICO man-made leather/Montfoort fabric and a leather multifunction steering wheel with perforated grip area. Details like contrasting topstitching, silver chrome highlights and sail pattern trim round off the high-quality feel. 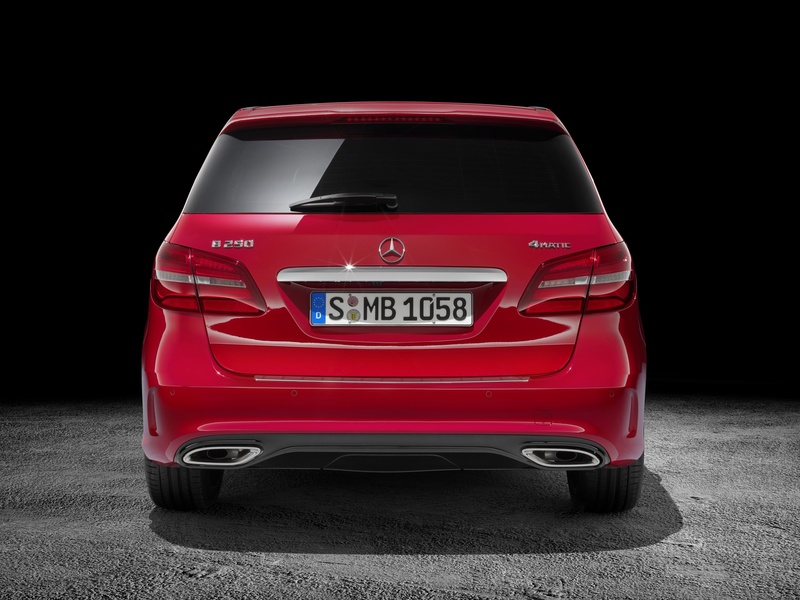 The AMG Line augments the vehicle’s sportiness and exclusivity. Powerful AMG bodystyling ensures a dynamic appearance along with the radiator trim, which has two louvres painted in iridium silver and chrome inserts, and the two-pipe exhaust system integrated into the bumper with chrome look tailpipe trim. A lowered comfort suspension with Sports Direct-Steer system improves handling and boosts driving enjoyment. 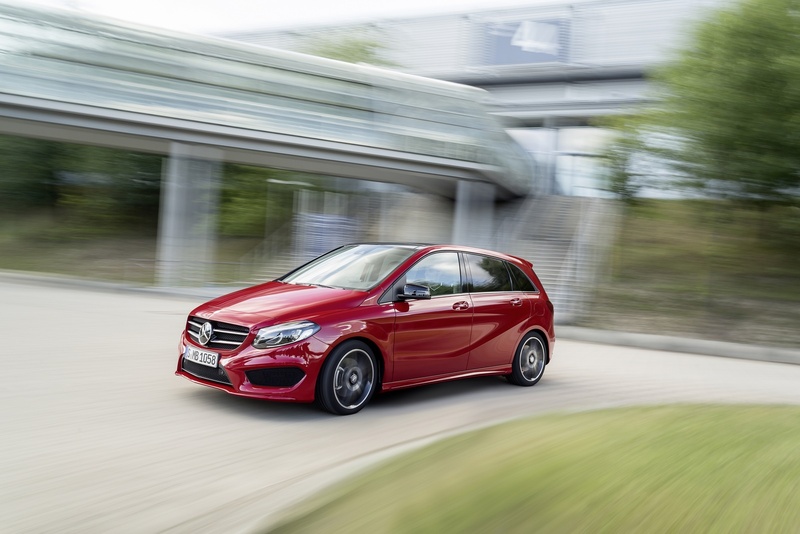 45.7 cm (18-inch) 5-twin-spoke AMG light-alloy wheels, perforated brake discs at the front, and brake callipers at the front with Mercedes-Benz lettering complete the striking exterior. Seats in ARTICO man-made leather/DINAMICA microfibre and the multifunction sports steering wheel with flattened bottom section, as well as a gear lever with perforated leather, add stylishly sporty elements in the interior. This equipment line also includes red contrasting topstitching on the door armrests, centre console, seats, and gear lever. Brushed stainless steel sports pedals with rubber studs are another highlight. The Night package allows the exterior to be individualised further. It includes selected design elements in black. The radiator trim sports two high-gloss black louvres and chrome inserts. The 45.7 cm (18-inch) high-sheen light-alloy wheels, exterior mirror housing, and shoulderline trim strips also come in black. Dark-tinted glass from the B-pillar to the rear protects against prying eyes and simultaneously emphasises the sporty character. Comfort, quality, and design are hallmarks of the Exclusive package. Highlights include heated front seats with 4-way lumbar support that, like the multifunction steering wheel and gear lever, are covered with high-quality leather. The instrument panel and door centre panel are trimmed with matching ARTICO man-made leather. Leather seats are available in the following expressive colours: cranberry red, hazelnut brown and black. Silver chrome design elements also help to create an exclusive ambience. Among the many other practical details are infrared convenience closing and a 12V socket in the rear. 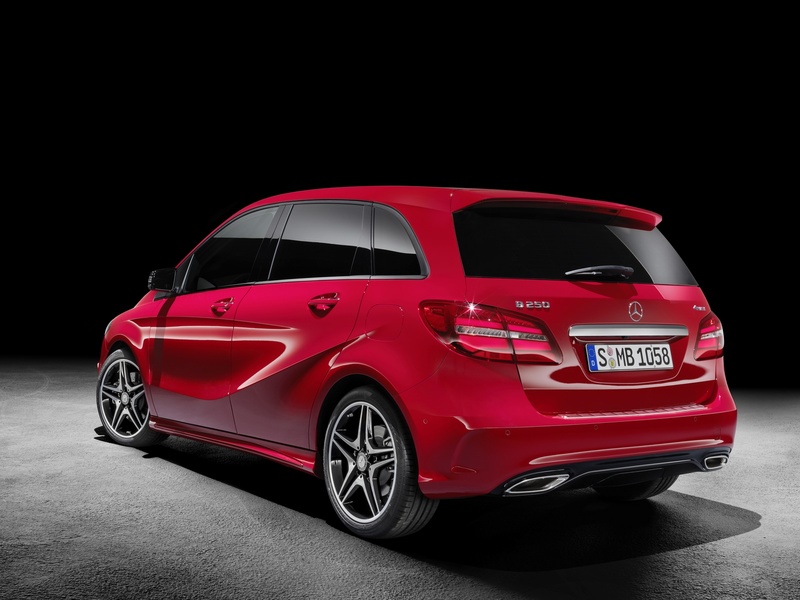 Building on the AMG Line, the AMG Exclusive package offers even more exclusivity, individuality and sportiness. Features include heated seats with 4-way lumbar support where black RED CUT leather upholstery with red contrasting topstitching creates striking highlights. To match them, the instrument panel and door centre panels, as well as the armrests in the doors, are trimmed with ARTICO man-made leather and have red contrasting topstitching. The leather multifunction sports steering wheel with flattened bottom section and perforated grip area and the leather gearshift lever emphasise the sporty character. *Figures for model with 7G-DCT in brackets, **provisional figures, ***recommended retail price in Germany, including 19% VAT.